Café Bistro in East Residence is a delightful sit-in or take-out café for students to grab a bite to eat on campus! Complete with a wall-mounted flat-screen TV and a fireplace, this is a real hot-spot! Closed for the remainder of the year! This location is a triple-win! It's a variety-store for students built right into West Residence, coupled with our Quesada Burritos & Tacos location, and one of our many Tim Hortons self-serve kiosks. 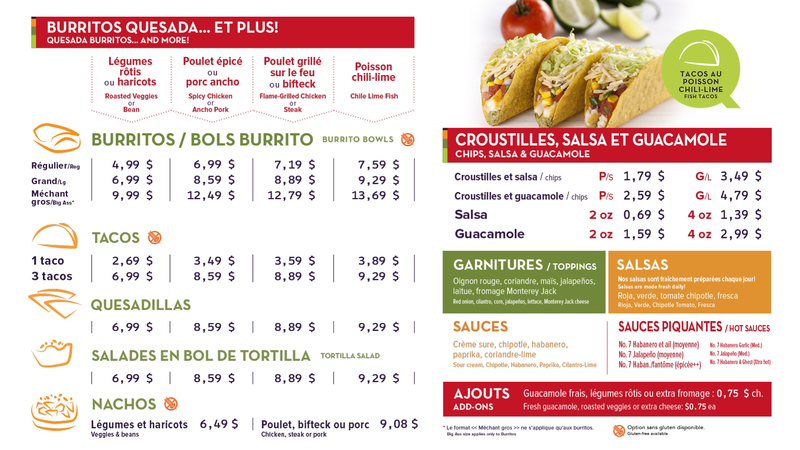 Located right beside one of our full-menu Tim Hortons in the newly renovated Alphonse Raymond building, Marché Alphonse offers an assortment of sandwiches, soups, salads, and hot entrées. This is a great spot to grab a healthy lunch on campus! This hidden gem can be found within our Cravings location in West Residence! Preparing wholesome, nutritious, great-tasting food is the most important thing we do. We start with the freshest ingredients and traditional Mexican recipes. Our salsas and guacamole are made fresh daily in store. The result? The tastiest burrito ever! Located in Alumni Hall, you'll feel like you've died and gone to Canada? Smoke’s Poutinerie has taken the Iconic Canadian dish of Fries, Cheese Curd and Gravy and has created an entirely new food category complete with unlimited variations of topping ingredients to choose from. Whether your preference is beef, chicken, vegetables, pork or simply a different type of sauce, Smoke’s Poutinerie has the recipe for you! Pastries and confectionery items, it offers Starbucks’ wide range of caffeinated and decaffeinated beverages as well as gift items. Located next to Smokes Poutinerie in Alumni Hall (and in the Great Hall during Summer months), you can find our Fresh Grill. Offering a large variety of grill favourites such as hamburgers, cheeseburgers, clubhouse sandwiches, French fries and soups! Located in the newly renovated Alphonse Raymond building, this Tim Hortons offers a partial selection of pastries, and breakfast items. Also offering a partial selection of Tim’s hot and cold beverages. A great selection of pastries, soups, sandwiches, chili and other specialities. Full selection of Tim’s hot and cold beverages. Topper's Pizza originally started right here in Sudbury Ontario! One taste of their Amazingly Delicious™ pizza makes it very easy to understand why Topper's Pizza now has over 40 locations across Ontario. The University Club offers cozy confines and great views of the Sudbury campus for the informal gathering of faculty, graduate students, staff and alumni. The space is located on the 2nd floor of the Fraser Building, where large windows create a light-filled space and provide views over Ramsey Lake and the natural setting of the University. The club was created to reinforce the intellectual and collegial life of the University. Staff, faculty, graduate student or alumni membership is required. To book your function at The University Club, please conact Monique Trottier by phone, or by e-mail.